That’s not how The Great Holiday Baking Show works, though. Time management is one of the primary differentiating factors between the competitors, and it proves to be Ainslie’s undoing. Hers is a compelling case when it comes to where time management issues start: whereas Nicole’s issues with the technical bake have to do with losing track of time (focusing so much on one task that she fell behind on the most important one), Ainslie’s problem in both cases was creating bakes that could not reasonably be completed in the time allotted. In the Signature Challenge, the choice to go with a rough puff pastry created a recipe that everyone agreed would have been great if there were fifteen minutes in the challenge. In the Showstopper, meanwhile, Ainslie’s chocolate glaze dipping took up too much time, meaning she was never going to have the opportunity to solve the design flaws in an aesthetically pleasing fashion. 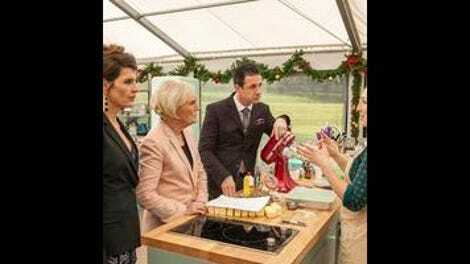 It’s the ultimate paradox of the Bake-Off format: it absolutely values ambition right up until it doesn’t. The Technical challenge is all about skill, and Ainslie thrives on a recipe—Mary’s Holiday Fruit Tart—that is designed to be baked in the time provided. But when you give Ainslie control over her bakes, she never found the sweet spot between time, her technical skills, and her ability to bake in a high-pressure situation. You may be able to practice your bakes (for those who don’t know, the bakers are given the challenges ahead of time to practice at home), but you can never fully prepare for being in the tent and on the clock. It’s a reminder that those eliminated from this series are not failing at baking so much as they are failing at being successful competitors within this particular baking format. It’s a format that Tim succeeds at this week by being very, very solid. Mary loves both of his breakfast pastries in the Signature, which he was able to pull together because he chose shortcrust pastry (along with Nicole, with Lauren joining Ainslie on Team “Rough Puff, Rough Time Management”). His tart is a solid second place, and his final bake—although lacking in the same level of decorating technique as his competitors—is visually striking and well flavored. Outside of a clever antler mold, Tim didn’t do anything that screamed star baker, but that’s maybe the trick of it: the trick to being star baker is focusing less on trying to be star baker and more on making sure your bakes are rock solid (or, in this case, light and crisp). Lauren, dethroned as star baker, could do all the beautiful spun sugar work in the world and there was no way her poorly conceived star-shaped choux was going to win her the day on this one. While Tim might not have been screaming star baker, Nicole was screaming quite the opposite. I don’t mean this as a slight on her or her baking, but rather an acknowledgment that Nicole has consistently seemed at odds with elements of the competition. Her running commentary, which I discussed last week, has always placed her as an outsider—here, she consciously emphasizes that she’s never heard of some of the terminology Mary uses in her recipe, while noting that she’s made pastry crème but never sees it in Georgia where she’s more likely to just use icing. She has consistently framed her approaches around simply doing what she does; this is never necessarily in defiance of the competition, exactly, but it’s always setting up a certain degree of distance between what the competition is asking of her and what she’s comfortable with. Some of the discussion in last week’s review centered on whether or not Nicole’s personality fits with the Bake-Off format, which tends to lean toward bakers who are less performative. There’s a moment during “Pastry Week” where she tells an extended story about her grandmother and bananas, narrating her way through making the crème for her choux pastry. It’s basically what she would do to liven things up as she went through a recipe as part of a cooking show (it reminds me of Top Chef’s Carla Hall, now on The Chew), and it’s something that is definitely less common in Bake-Off than it is on American cooking shows more broadly. However, on a personal level I don’t think it’s necessarily at odds with the format, and I appreciate it when there’s only four weeks’ worth of episodes to work with: understanding Nicole’s social dynamic while baking helps build our her relationship with the others, and create a stronger connection—whether positive or negative—heading into the final than I think one could feel for the other two bakers. The fact that we’re already at the final brings us back to time management, although this time on the part of the producers. Time is crucial to the show as well as the bakers: for a narrative of time management to emerge, the show needs to be able to articulate time. It’s also the primary job for the show’s hosts, who spend most of their screen time informing the bakers how long they have remaining. It’s a pretty basic job, and it’s also one of the key spaces where those hosts—Ian Gomez and Nia Vardalos—are able to place their stamp on the program. And it’s not been particularly pleasant (and here I’ll be comparing the two shows, so if you’re not interested you can jump down to the Strays and go from there). It’s unfortunate, as the dry and witty humor of these segments is one of the pleasures of the Bake-Off in general, but this week in particular was a stream of bad puns, and I say that as someone who typically believes all puns to be good puns. Part of this comes down to weak writing, raising lots of questions about the hands-on approach Sue and Mel take when hosting the British series. But what I also realized is that there’s just a general “mugging” feeling to both Gomez and Vardalos that would make even great jokes play as bad ones: the camera just lingers on them for a few seconds too long, reminding us there’s a director off-camera instructing them on how to read the line, and that this is probably the fifth take of a line that they’re shooting after the challenge is over to insert later. While Sue and Mel are funny because they know they’re jokes aren’t funny, Ian and Nia fail because they don’t know their jokes aren’t funny, and the show is treating that like the joke. The same inserts happen on the British series, but there Sue and Mel feel much more like real people, and this has a lot to do with time. On a broader scale, they’ve been hosting the show for longer, which both means they’re more comfortable with the flow of the show and we’re more comfortable with them as hosts if we’ve watched multiple seasons. However, there’s also much more of Sue and Mel actively in the kitchen with the contestants, in part due to the longer running time in the U.K. and what seems like a generally more consistent presence in the tent. By comparison, it feels like Gomez and Vardalos are only ever in the tent when making an announcement, or taking part in a visit from the judges. This isn’t entirely true—Ian tastes Nicole’s pumpkin butter, for example—but those moments never resonate, and I don’t feel like the two hosts ever come across as their natural selves at any stage. Their most personable moment is when they move to ensure that Nicole’s reindeer doesn’t lose its head, but it comes too little too late in the episode to make much of an impact. And while I obviously don’t know the two actors personally, I feel like we’d know if they were really putting themselves into this. Instead, it feels like their relationship with the show is also damaged by time: this would have been a short-term commitment, only four episodes likely shot over the span of at most two weeks if not even less. They didn’t have months to get a feel for the flow of the program—depending on when they were hired, they might not have even been able to watch anyepisode of Bake-Off to get a feel for the flow of the series. They came into a job they were hired to do, followed directions on what the producers needed to cut together a coherent episode, and ultimately have struggled to find the sweet spot that helps make the format the success it is. Much as Lauren hopes she can bounce back from her mistakes this week, and Tim hopes his own bounce back from his early struggles continues, I have to think that Ian and Nia would see a possible second installment as a chance to take some time to reflect on the format, and figure out the way to make the show’s time management into less of a metaphorical soggy bottom should The Great Holiday Baking Show return. I understand why Ainslie went home, but it’s hard to accept on some level when you saw how close Nicole was to completely falling apart on the last two challenges. I credit her for pulling both together into presentable outcomes, but with the mixed critique on her Signature she succeeded mostly because she did a better job with managing her problems than Ainslie. Curious to see how she comes together for the final. I’ve seen Choux pastry on the Bake-Off before, but I feel like they never spelled it onscreen, because my brain’s been on “Shoe Pastry” since I watched that challenge. Whoops. I can’t tell if Mary’s bemusement at Johnny’s innuendo—breakfast in bed! Mary’s fresh tart!”—is genuine, or if she’s just heard the joke so many time during retakes that she’s in disbelief at it all. Either way, I’m enjoying her enthusiasm (which feels dialed up a bit, perhaps to reflect the holiday spirit, or perhaps because the producers believe Americans need cheerier hosts). 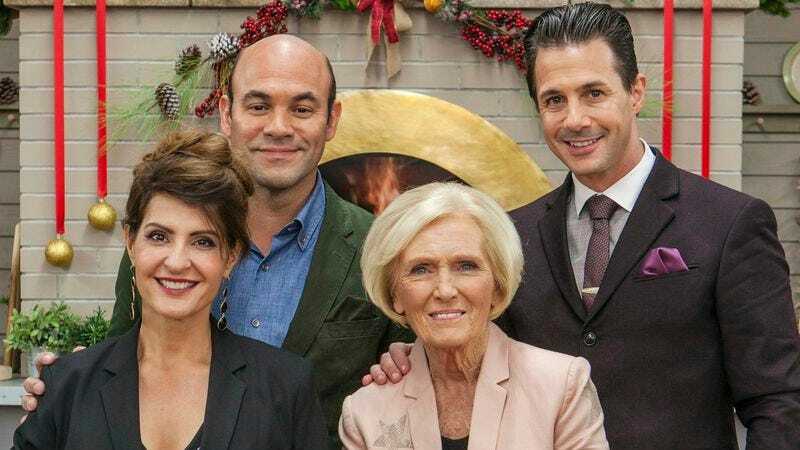 It’s exaggerated by the greater inconsistency of the chefs and the short amount of time to get used to the competition, but I wonder how many times the winner of the technical challenge has gone home in Bake-Off history. Is there a Bake-Off statistician I can throw to? Speaking of sports analogies, I think Sue and Mel benefit from the fact they get to function more as sideline reporters than announcers or color commentators much of the time, allowing them to develop more of a rapport with the bakers. Ian and Nia are doing too much announcing. Choux pastry featured somewhat prominently in a season three episode of Pivot’s Please Like Me—I realize this is not entirely relevant, but it’s a great show, and I’m using this tangential connection to inform you accordingly. Predictions for the finale? Given that it’s likely to move back into her strengths, I’m guessing Lauren still wins, although I’m probably “rooting” for Tim at this point given his solid performance this week. You can find the recipes for the Signature and Showstopper bakes on ABC’s website.